This sequence of images is extracted from the music video for “Basket Case” by the band Green Day. It features a variety of shots from the the opening lines of the song. There is an interesting use of high-value, high-saturation colours in what might be considered as negative space, namely in the floor and background wall of the shots. This creates a jarring effect that makes the darkly-clothed lead singer the focal point of each shot due to contrast produced by the comparatively low-value colours. This is essentially the inverse of the effect seen in the Burning Man photograph in my first post. 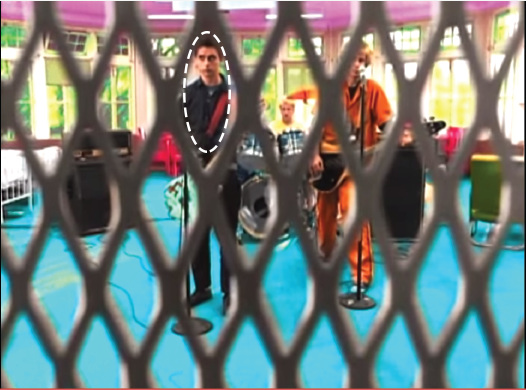 The use of bright colours is augmented by similarly bright artificial lighting, creating the sense of a brightly-lit hospital psych ward which is evoked by the hospital staff seen throughout the video. The final shot of this sequence has an interesting composition. With the still being shot through what seems to be a ‘jail-bar’ like door, it creates a sense of entrapment. This is the basic concept of the music video making this shot crucial to the message. The sequence uses varying points of view, alternating between long shots, mid-shots and close-ups. As the shots become closer to the subject, the camera angle seems to become higher, which conveys a sense of vulnerability. This is consistent with the theme of the video which is about personal insecurity and generally being a “basket case”. Expressive Content: The colours and choice of shots in this image sequence strongly give the uncontrolled and ‘insane’ vibe the artist was looking for. The speedy shot changes, and hyper interactions between people allow the message of the song to come across to it’s audience. Rose, Gillian. Visual Methodologies : An Introduction to the Interpretation of Visual Materials. London, GBR: SAGE Publications, Incorporated, 2001. ProQuest ebrary. Web. 5 September 2014.